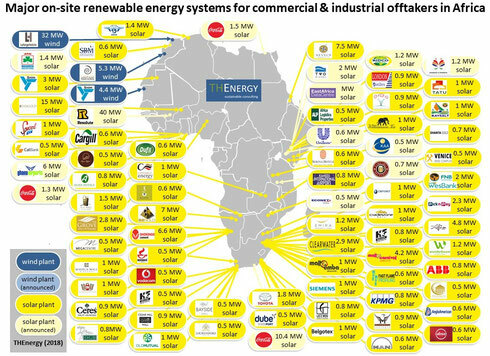 Commercial and industrial off-takers might become a main driver for the energy transition in Africa. THEnergy is at the moment conducting a survey in this attractive market segment to provide detailed insights. Around the world, more and more commercial and industrial off-takers integrate renewable energy solutions for powering their sites. Different business models can be observed: onsite renewable energy generation or supply through the grid. Companies often have the choice of investing their own capital or buying the electricity from an independent power producer. In hybrid projects, renewables will reduce the consumption of diesel or heavy fuel oil. We see renewable energy projects in numerous sectors such as mining, cement, fast moving consumer goods (FMCG), food and beverages, telecommunications / telecom, agribusiness / agriculture, chemicals, pharmaceuticals, plastics and rubber, wood processing, textile and garments, refineries, banking (such as ATMs), petrol service stations / filling stations, data centers, real estate, shopping centers, and hospitality such as hotels, island resorts, restaurants, or safari lodges. The objective of the study is to enquire about the drivers of renewable energy adoption in the commercial and industrial segment in Africa. What are the bottlenecks? What could speeding up the development? What are regulatory requirements? 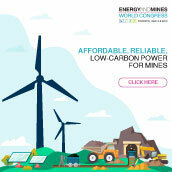 We will also have a look beyond renewables and analyse energy storage solutions. We are still looking for commercial and industrial offtakers to participate in the survey. As an incentive, we will share the results with those we select for the survey. You will even have the opportunity to ask questions in an exclusive conference call. Are you interested in which direction your industry is developing? Participating in our study is also an easy way of supporting renewable energy deployment in Africa! Contact us under info@th-energy.net to participate. The phone interview will only take 15-20 minutes. Are you interested in the results of the study? Please subscribe to our newsletter and we will keep you updated: https://www.th-energy.net/newsletter/. I hereby like to introduce our company Dutch & Co to you. We would be interested to get in touch to discuss various opportunities in West Africa. Dutch & Co. Ltd. is an experienced (over 25 years) Development and EPC Company based in Africa and Europe. It is with great pride that we have been adjudged the “Best Renewable Energy Company of the Year” at the 2018 Ghana Energy awards. “Bridge the gap between supply and demand of electricity in Africa”. • We first reduce the demand by installing Energy Saving LED lights. • We then increase the supply of the electricity by developing and executing turn-key PV Solar Installations. With our in-house team of well trained and experienced technicians, we do not just take responsibility for Development, Engineering, Procurement and Construction but also execute the role as Operation & Maintenance partner.